(October 29th to 31th,Bengaluru,India) Synway ,as a world-leading telecommunication provider, attended CeBIT INDIA 2015 with its high performance and cost effective VoIP gateway family in Bengaluru International Exhibition Centre. CeBIT is the biggest exhibition of CTI, and has attracted 6200 exhibitors form 70 difference countries and 480000 visitors to be here. Synway strengthens its advantages in India market and enhanced the brand reputation of Synway gateway in India communications industry. Attaching high importance to India market, Synway has run its office in Delhi to better serve its hundreds of clients, including developers and SP, as early as 2008.Synway has built stable relationships with local customers and partners, and won high market share in CTI arenas in India, due to its efficient localized service, complete product range and high-performing products lines. Synway will continue to develop its partnership with existing prospective clients in India market in the future. At the event, Synway showcased its VoIP products and solutions, including the analog/digital gateway, the multimedia switch SPBX as well as the latest SMG wireless gateway. 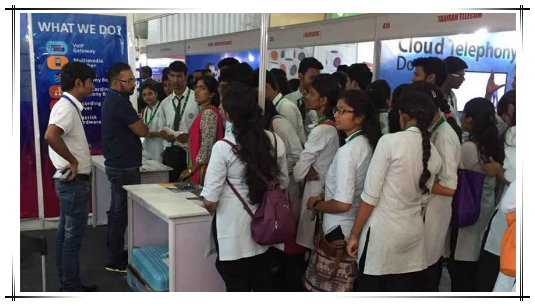 Worthy of notice, SMG1000 Analog series imposed high impression upon these visitors, for its modular design, state of the art workmanship, and its cost advantages, which attracted many Indian communications professionals to explore more products information in the Synway booth. SMG 1000 VoIP Gateway allows for a well-planned, phased migration to an IP network, making the gateways an easy solution for enterprises looking to enhance their legacy PBX equipment with new VoIP access and applications. Connected between a PBX or a LAN, the SMG1000 Gateway converts analog PSTN messages into a format suitable for transmission over standard IP networks. As a leading designer of Telecom hardware and IP communications, Synway has been specialized in providing VoIP Gateway, Softswitching Platform, CTI Voice Board and Call Logging Hardware since 1990s. Over 3,000 solution providers from 56 countries have benefited from Synway’s widest product portfolios and decades of service expertise, and applied Synway’s signaling and media processing technologies into Unified Messaging, Call Center, SIP Trunking, Soft Switching, and more IP communications. Central Theme CeBIT INDIA 2015 - Discover the digital business solutions marketplace. Business is going digital, with traditional processes and business models now undergoing massive digital transformation.